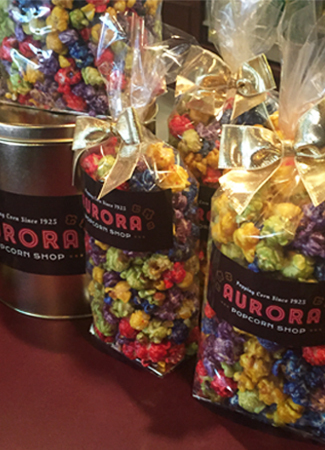 The Aurora Popcorn Shop offers a variety of beautifully decorated gift bags, colorful tins and special gift packages! 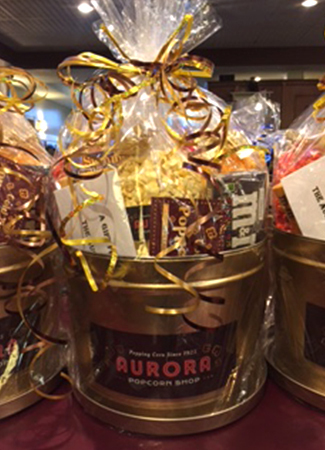 Our Gift Bags are the perfect way to say thanks whether as a hostess gift or teacher recognition. We offer three sizes-small, medium and large-and each has a either a gold or red satin bow. We offer a variety of tins based on the season and the occasion. Our Signature Gold Tin includes our Gold Popper offer. You can bring in your gold tin for a special discounted refill price for our frequent fillers! We are very happy to create custom gifts and gift packages to meet your needs.